The first images of SpaceX Falcon Heavy rocket were released Wednesday, showing the Falcon Heavy’s 27 Merlin 1D engines mounted on the back of three modified first stages from Falcon 9 rocket. The massive triple-core booster looked almost fully assembled inside the hangar at the Kennedy Space Center’s pad 39A.The mega-rocket features two side-mounted boosters that have been recovered from previous Falcon 9 missions, and a newly-built central core designed to handle the more intense aerodynamic and structural loads the Falcon Heavy will encounter during the flight. 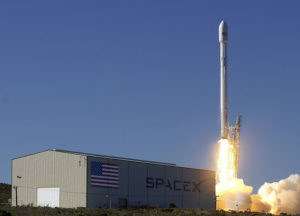 The two side boosters were first used with the Thaicom 8 communications satellite at the SpaceX ninth resupply mission to the International Space Station last year when the Falcon 9 launched from Cape Canaveral and landed at sea. The kerosene-fueled Falcon Heavy’s engines will generate up to 5.1 million pounds of thrust during launch. So the Falcon Heavy will be the most powerful rocket in operation departing Cape Canaveral since NASA’s Saturn V, which sent astronauts to the moon.